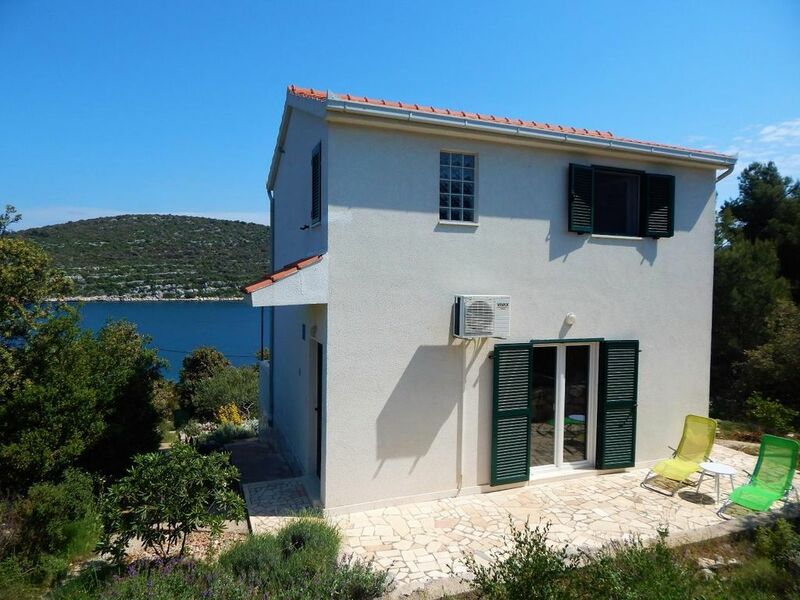 This beautifully furnished house is located on the island of Drvenik Veliki on location away from mass tourism with a beautiful panoramic view of the sea.Just 40 meters from the house there is a small secluded concrete beach for sunbathing,swimming and snorkeling . Enjoy the spacious terrace with summer kitchen and relaxing view of the bay that is just ideal for get-togethers and cosy barbecues.Lovers of nature and active holidays will be inspired by this beautiful island with lush Mediterranean vegetation, long walks through nature and crystal clear waters.If you want a true escape from the stress, traffic jams and problems of everyday life, then this peaceful island oasis and Villa Marela is just for you!! Villa Marela has a 70m2 living space and two terraces of 15m2 each on a 500m2 land lot.Villa has two bedrooms (one with two single beds and one with double bed),one bathroom with walk in shower on the first floor, one separate toilet on the ground floor, living room with kitchen and fold out sofa bed(for two persons) , south terrace and north terrace with grill and outdoor kitchen .Villa has a large Mediterranean garden with olive trees.Free wireless internet , Air conditioning and HD satellite channels on 4K UHD SMART Android TV is available for our guests. Not suitable for infants (Under 2 years).Smoking is allowed on the terrace and outside of the house.Maximum pets(dog or cat) allowed:max.2. We offer a free berth for boats up to 7 m in front of the house. On request, you can rent a boat from the owner. Drvenik Veli is an island situated in middle Dalmatia and only 8 nautical miles away from town of Trogir. Its area is 12.07 square kilometers. The only settlement on the island is the old fishing village of Drvenik Veliki with a population of 168 and the island was first inhabited in the 15th century. In Croatian documents from the 13th century the island is mentioned as “Gerona” or “Giruan”. The coast is rugged and consists of many bays with sandy and pebbly beaches.On the south part of the island is beautiful bay Solinska, and on the east part of the island is a nice place called Krknjaši famously known by the name of Blue Lagoon.In the old village there are two restaurants, one bakery and one small store. There are many beaches near by and the locals are welcoming and friendly. Unspoiled nature, beautiful beaches and a peaceful environment are perfect for a quiet and intimate holiday.